Celebrate Gift Wrap, Balloon Pop! 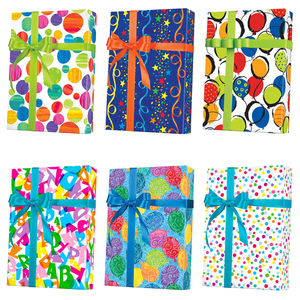 Give the perfect birthday gift in this Party & Celebration gift wrap. Finding the perfect gift wrap can be hard but worth it in the end. Receiving a gift with amazing wrapping paper always feels great. Many sizes available, full ream, ½ ream, cutter box and jeweler's rolls. You will find giftwrap from Jillson Roberts, Shamrock and Sullivan. Jillson Roberts (JR) is an Eco-Friendly company. They offer Eco-Friendly Gift Wrap that is a plant based-non-petroleum packaging. Their gift wrap is high-quality with medium thickness. Select gift wraps have grid lines to make cutting easier. JR gift wrap is smooth with few textured patterns. Shamrock is a family owned company, founded in 1957. There Gift wraps are high quality and smooth. High speed presses provide maximum efficiency and cost effectiveness. These presses can apply specialty finished including UV, gloss and matte varnishes. Made in the USA. Sullivan gift wrap was founded by George Sullivan. With over 75 years' experience, Sullivan prints amazing gift wrap. Sullivan offers many different patterns with a large amount of textured gift wrap. This gift wrap is high quality and thick.